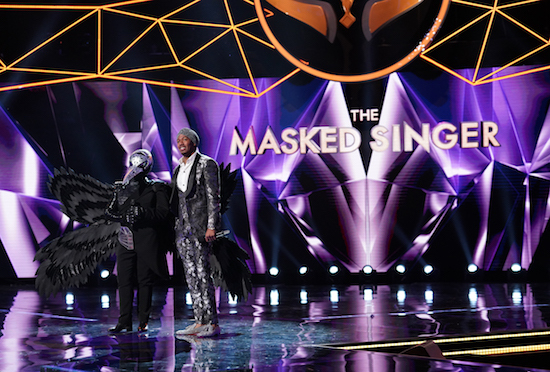 THE MASKED SINGER: L-R: Raven and host Nick Cannon in the “Touchy Feely Clues” episode of THE MASKED SINGER airing Wednesday, Feb. 6 (9:00-10:00 PM ET/PT) on FOX. © 2019 FOX Broadcasting. CR: Michael Becker / FOX. The Raven was the latest MASKED SINGER contestant to be unmasked, and it was…Ricki Lake. She joins NFL player/the Hippo Antonio Brown, comedian/the Pineapple Tommy Chong, the Poodle/Margaret Cho, the Deer/Terry Bradshaw, the Poodle/Tori Spelling as the celebrities unmasked on the series.